MSI, the global leading brand in All-in-One PC, is constantly developing innovative new technology and leveraging its impressive R&D capabilities. At Computex Taipei 2011, besides showcasing its new All-in-One PC models, which emphasize vivid color reproduction, environmentally-friendly business functionality and smart digital lifestyles, MSI will also be displaying three new desktop PC models: the 1-liter Wind Box DC100, MSI's latest ultra-mini PC; the 4.7-liter Wind Box DC540 desktop; and the large, 10-liter Hetis H61 desktop. These new models add improved panel design to the slim, lightweight and visually attractive characteristics of earlier MSI desktop PCs. The WindBox DC100 has a fashionable new external appearance, together with the energy-saving, high-performance AMD E-350 APU processor capable of supporting 1080-pixel high-definition video output and 3D online gaming. The Wind Box DC540 is equipped with the latest Cedar Trail-D platform processor, while the Hetis H61 uses an Intel® second-generation CoreTM i processor, which provides significantly enhanced performance. 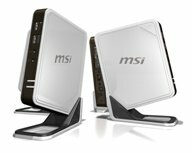 All of MSI's desktop PCs come with Microsoft Windows 7 (Home Premium version); combined with their high-performance processors, this ensures that they are able to meet all normal home computing and work computing needs. MSI has given these new desktop PCs a fashionable, aesthetically appealing external appearance that will suit the varying home décor preferences of individual users. With these new desktop models, users can enjoy outstanding performance at reasonable prices. MSI's new-generation desktop PCs – including the Wind Box DC100, Wind Box DC540 and Hetis H61 – use Microsoft's new Windows 7 64-bit operating system and the Microsoft Office 2010 productivity suite. Combined with anti-virus software, this makes each PC a high-performance, secure work platform, and enables users to enjoy true peace of mind while using the PCs. Windows 7 is simple, fast, and appealing, and provides a wide range of search and file management methods, including jump lists and improved taskbar thumbnails, making it possible for users to undertake everyday search activity more rapidly. Windows 7 is designed to provide faster, more reliable performance, so that users can really get the most out of their PCs. When using the Internet, there is always the risk of computer viruses and data security issues; the anti-virus software with which MSI desktop PCs are equipped as standard ensures that users can put worries of this kind to the back of their minds. MSI's new-generation Wind Box DC100 1-liter desktop PC is equipped with the latest AMD E-350 dual-core processor and APU. Regardless of whether you want to use the PC for 3D online gaming or viewing movies, there is no need to spend money on an add-on graphics card, because MSI desktops' DirectX® 11 technology ensures ultra-realistic game images, while AMD's AVIVOTM technology ensures crisp detail in every image. With these new desktop PCs, MSI has given gamers a whole new visual experience for a very reasonable price. In addition, at a time when the idea of "green," environmentally-friendly PCs is becoming increasingly popular worldwide, the Wind Box DC100 uses AMD's latest Brazos platform APU, which has almost unbelievably low, 18-watt energy consumption. The Wind Box DC100 thus provides energy savings of nearly 70% compared to conventional desktop PCs, making it possible to reduce annual carbon dioxide emissions by over 810 kilos and save 180 trees. MSI's environmentally-friendly, energy-saving design allows PC users to enjoy high performance while still being green; MSI has created a new generation of desktop PCs that respond in a meaningful way to contemporary environmental concerns. MSI's latest 1-liter ultra-mini desktop PC, the Wind Box DC100, uses a fashionable design concept with soft, smooth lines while maintaining the slim, lightweight appearance of earlier MSI desktop PCs. It looks good in any type of home environment, constituting the ultimate home furnishing accessory. The Wind Box DC540 is equipped with the latest Cedar Trail-D processor, while the Hetis H61 uses the 2nd generation Intel® CoreTM processor, with the graphics processing unit (GPU) and CPU integrated onto the same chip in a revolutionary new design which ensures outstanding image quality when watching video content or viewing photos. The Sandy Bridge processor used in the Hetis H61 provides high performance while also maintaining efficient energy usage. The built-in GPU facilitates the sharing of resources, which can be automatically transferred between the CPU and GPU as needed to enhance processing speed and improve individual work performance.